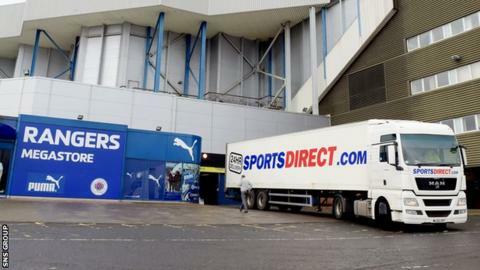 Rangers say they have now repaid in full the £5m loan from Mike Ashley's company Sports Direct. Newcastle owner Ashley, who has a near 9% share in Rangers, gave the Scottish Championship club the money in January to help them remain solvent. In June, shareholders voted against an immediate repayment. But that decision was reversed at the club's annual meeting in November, with chairman Dave King saying it had taken an hour to raise the funds. A club statement read: "We are pleased to announce that payment has today been sent to Sportsdirect.com Retail Limited of the full amount of the loan facilities provided by that company to The Rangers Football Club Limited." After the Scottish Football Association had rejected Ashley's request to raise his stake in Rangers above 10%, Sports Direct offered the previous board £10m to stay afloat. Half that sum was made available as immediate working capital and was used to repay a £3m loan made by Ashley last year. The terms saw Ashley get security over Rangers' Murray Park training ground, registered trademarks and other properties. For the duration of the loan, Ashley was granted a further 26% of shares in Rangers Retail Limited, 49% of which was already owned by the English businessman. With a Dave King-led boardroom change at Ibrox in March, the second half of the proposed loan was never drawn down. In May, Ashley called for an extraordinary meeting to pay back his £5m, with the motion failing to receive the necessary backing from shareholders. Sports Direct then won a court injunction against Rangers disclosing confidential information about its retail deal with the club. Earlier this month, King's legal team told London's Royal Courts of Justice that the loan had been repaid, only for Sports Direct lawyers to say that was not the case. That was during a failed bid from Sports Direct to have King jailed for allegedly breaching the gagging order on the retail deal.